M&T partners with Buffalo State College to get students hands-on experience through internships. Gaining real-world experience in your field of study as part of your college experience is one huge benefit of internships—think of it as “trying on” your career to make sure it’ll fit. Internships are a smart move for many reasons, including providing an opportunity to learn new skills, enhance existing skills, network within your desired field, gain confidence and leadership abilities, enhance your resume and, in some cases, be compensated financially. Mikayla Miloshevski, an NU College of Hospitality & Tourism senior, hopes to become general manager of a major hotel. Last summer, she interned at the four-star Grand Hotel Imperial in Moltrasio, Italy as part of her studies. For Lucas Santos, a senior Animation major at Daemen College, the internship he completed at production/post production company dPost in downtown Buffalo fit perfectly with his career goal of becoming a 3D animator. And it’s not just the students who benefit from internships. Beth Donovan, APR, senior vice president at dPost, said staff members learn from interns as much as the students learn from them. M&T Bank views its internship program as a way to give back to the community and to gain earlier access to potential new hires. Its partnership with Buffalo State College provides students the opportunity to explore the variety of jobs that exist within banking. 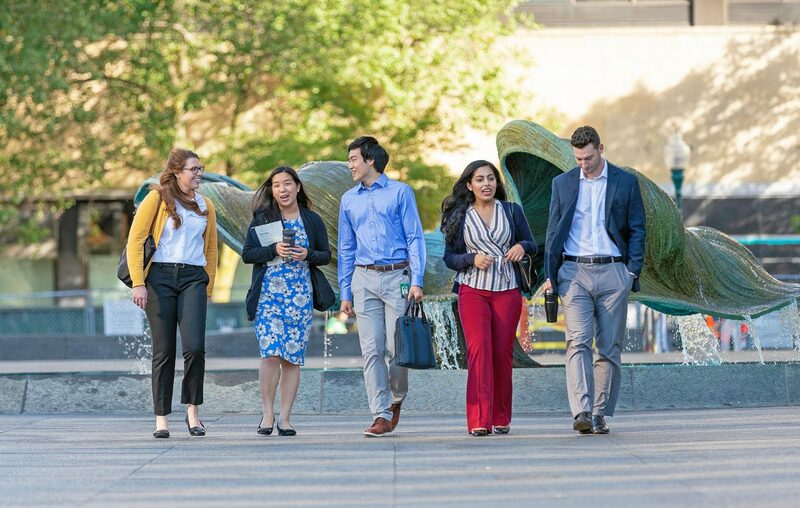 “We encourage students in all majors to apply, as there are possibilities throughout the bank, including technology, marketing, cyber security and compliance,” says Andy Smith, vice president and campus recruiting team manager, who says M&T looks for well-rounded students with excellent academic performance and on- and off-campus involvement, leadership experience and good interpersonal skills. Nigel Peters’ dream is to eventually travel the world, working in IT for a major hotel. That’s why the Queens, New York native—who recently graduated from Buffalo State with a Bachelor’s degree in Computer Information Systems and a minor in Hospitality and Tourism—eagerly participated in a 10-week paid internship last summer in M&T Bank’s Retail Credit Risk Department. Peters says he participated in several projects with M&T mentors that gave him hands-on experience in his field of study. Competition for entry-level positions is often fierce, and an internship can mean the difference between your getting a job “that offers a paycheck” and one that will kick start the career of your dreams. As you begin your college search, make sure you explore whether your colleges of choice offer internship programs.